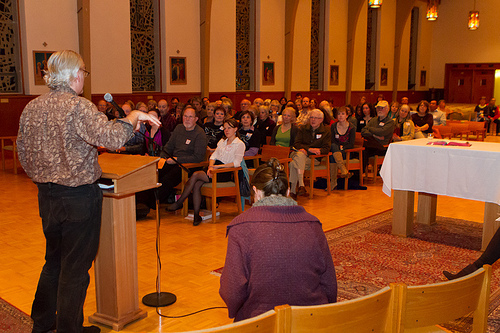 On the evening of November 15th, over 80 people from around the Midwest gathered to celebrate the 25th anniversary of Sister Parish, Inc. We gathered at St. Joan of Arc Catholic Community in Minneapolis, MN to share stories, build community and witness solidarity, faith and justice in action. 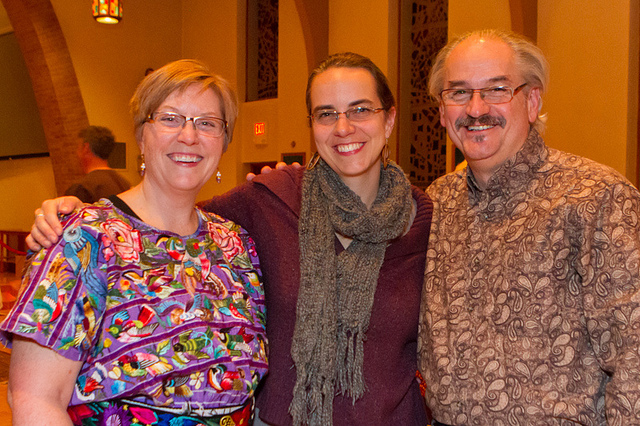 Music that unites people has always been a hallmark of Sister Parish gatherings, and this night was no exception. Led by St. Joan of Arc’s wonderful musicians Anna and Fred Vagle, we started by singing “Happy Birthday” to Sister Parish and we ended with a rousing rendition of “We Are Marching in the Light of God” — in English and Spanish. Through prayer, we gratefully honored Sister Parish members in the room and in the world, and we also remembered those who have passed away. Sister Parish co-founder Vicki Schmidt was not able to attend but her daughter, AnnaLisa Nash, read a letter from Vicki addressed to those at the gathering. In it, she looked back on the early days of Sister Parish and reflected on how the organization continues to be reborn today. Then Carrie Stengel, Executive Director of Sister Parish, Inc., provided an update. She spoke of the health and growth of the Sister Parish organization and pointed out that, in spite of the many challenges facing Central America and the US, the resilience and spirit of those who work for social change gives her hope. 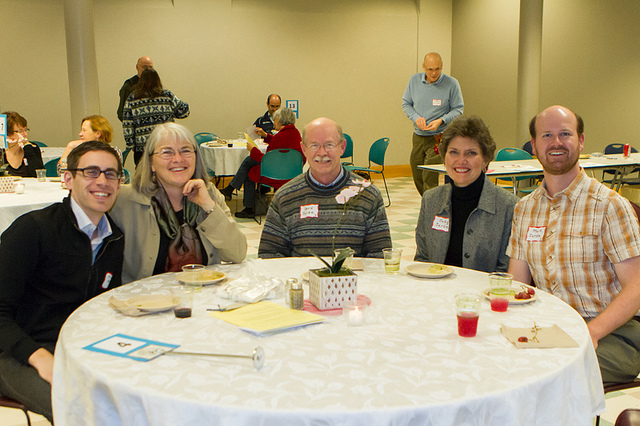 After a delicious dinner catered by Salsa A La Salsa Restaurant, we viewed the premiere of the documentary Generations In Solidarity: The Sister Parish Story. Produced by St. Joan of Arc parishioner and Sister Parish, Inc. Board member Jeff Nohner, this powerful film looks at the context in which Sister Parish was conceived 25 years ago and how the work of sistering is just as relevant today. A raffle drawing for several wonderful prizes — including an overnight stay at the Covington Inn, a floating B&B on the Mississippi River — capped off the evening. All funds raised during the evening will go to Sister Parish, Inc. to support its work of uniting communities in the U.S. and Central America. All in all, it was a wonderful evening of building community, honoring relationships, sharing stories and hopes, and celebrating the first 25 years of this remarkable organization. See our Flickr page for more photos of the event and our Solidarity Walk the following day. 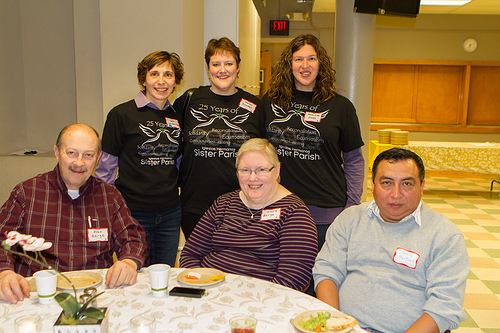 We would like to extend a big thank-you to all who attended and to the St. Joan of Arc community for hosting the event. Happy 25th anniversary Sister Parish! 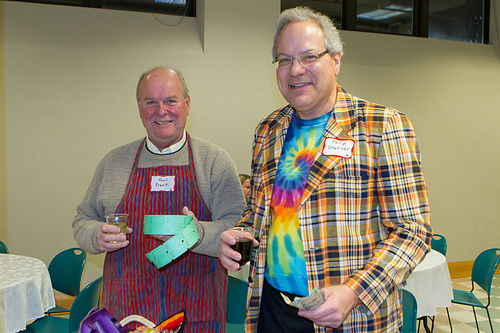 This entry was posted in 25th Anniversary, United States and tagged 25th anniversary, board member reflections, decorah, Faith Lutheran, incarnation, st joan of arc, vicki. Bookmark the permalink.